Domestic Violence Lawyer, James C. Gallo has been fighting to get battery charges like yours dismissed or reduced to lesser charges for over 18 years. If you have been arrested or charged with domestic violence or any criminal offense in the Las Vegas metropolitan area, you need to call or e-mail our office now and speak with a knowledgeable criminal defense lawyer regarding your criminal case. 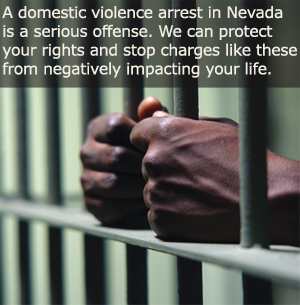 A domestic violence arrest in Nevada is a serious offense. James C Gallo can protect your rights and stop charges like these from negatively impacting your life. The crime of domestic battery is considered an enhancement crime in the State of Nevada. After suffering a conviction, the individual is exposed to enhanced penalties upon a subsequent conviction. A third conviction within a 7 year period requires a mandatory prison sentence in the Nevada Department of Corrections.